A cadre of public interest groups and at least 22 attorneys general have filed petitions this week challenging the FCC order that seeks to gut net neutrality. But before the real legal challenge begins, net neutrality advocates are fighting to ensure the case is heard in their court of choice. The dubiously titled “Restoring Internet Freedom Order” was passed in a party-line vote by the commission’s Republican majority in mid-December and the final text of the order was released earlier this month. The order overturns the Federal Communications Commission’s reclassification of broadband internet service providers under Title II of the Communications Act, a move that enabled the FCC to established strong rules that prevented ISPs from blocking or throttling online content or creating “fast lanes” for companies that pay extra to have their content delivered to customers at greater speeds. Those aiming to overturn the order perceive venue—where the case is heard—as essential to their efforts. Nearly all of the challengers would prefer the case be heard in Washington, DC, where three prior net neutrality cases landed in recent years, meaning the court will be more knowledgeable about net neutrality. Yesterday, however, Santa Clara County filed a petition in the US Court of Appeals for the 9th Circuit, which is encompasses 9 states, including California, Oregon, and Washington, as well as the territories of Guam and the Northern Mariana Islands. For those who want a say in where the case is heard, there’s only a 10-day window to file—however, no one is quite sure when that 10-day window begins. While the commission has already released the order, it has yet to be published in the Federal Register, the government’s daily journal in which rules and public notices are filed. Either event may serve as the kicking-off point for legal challenges, so several net neutrality advocates filed what are called “protective petitions” this week. To cover their bases, they will file again once the order hits the register. When multiple parties in multiple courts challenge an FCC order, the Panel on Multidistrict Litigation (MDL) holds a lottery to decide the court that will (at least initially) hear the case. The courts considered in the lottery are only those courts in which a party has filed a petition for review within the first 10 days after final publication of the order. Parties otherwise have 60 days after publication to file a challenge to an FCC order, but their preferred court will not be considered in a lottery after 10 days. 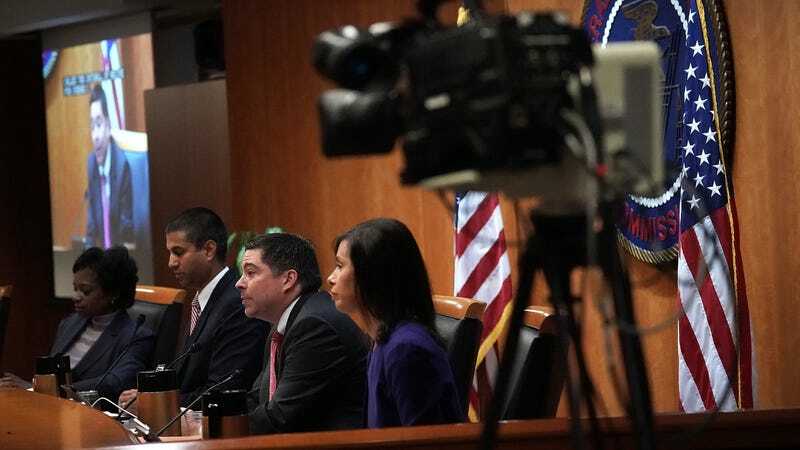 “There are also important legal issues to address, from the rushed and procedurally deficient proceeding, to the misguided move to unravel the Title II underpinning of the order and the strong net neutrality rules, to preempting states and localities from protecting net neutrality,” Sarah Morris, OTI’s director of open internet policy, said in a statement. “OTI will be on the front lines of these coming legal battles,” she added. Likewise, Public Knowledge, a public interest group with a focus on telecommunication policy and internet law, filed a protective petition in DC on Tuesday. Further, Bergmayer said that Public Knowledge supports the ongoing effort in Congress to overturn the FCC order using the Congressional Review Act (CRA). With every Senate Democrat and one Republican, Sen. Susan Collins of Maine, supporting the resolution, only one more Republican is needed to pass a resolution of disapproval in the Senate. However, the House will prove more of a challenge for net neutrality supporters. While more than 80 House Democrats have signed on to support a CRA companion bill so far, 218 signatures are required to send it to the floor for vote—bypassing House Speaker Paul Ryan, who does not support net neutrality. In a show of force Tuesday, 22 attorneys general from 21 states and the District of Columbia joined the legal battle. “An open internet—and the free exchange of ideas it allows—is critical to our democratic process,” said New York Attorney General Eric Schneiderman, who leads the effort. “The repeal of net neutrality would turn internet service providers into gatekeepers—allowing them to put profits over consumers while controlling what we see, what we do, and what we say online,” he said. The internet is a global, public resource. It relies on the core principle of net neutrality (that all internet traffic be treated equally) to exist. If that principle is removed—with only some content and services available or with roadblocks inserted by ISPs to throttle or control certain services—the value and impact of that resource can be impaired or destroyed. Ending net neutrality could end the internet as we know it. That’s why we are committed to fighting the order. In particular, we filed our petition today because we believe the recent FCC decision violates both federal law as well as harms internet users and innovators. In fact, it really only benefits large Internet Service Providers. Free Press, one of the first organizations to declare its intent to challenge the order, filed a petition yesterday in the 1st Circuit Court of Appeals in Massachusetts, where the organization is based. The Internet Association (IA) declared its intent to intervene in the lawsuit earlier this month. IA represents many of the country’s top tech companies, including Facebook, Amazon, Netflix, and Google. It, too, opposes the decision of the FCC majority. And while the association itself has not announced plans to join the lawsuit, acting as an intervenor would give it the ability to represent its members’ interests in the case as a third party. “IA intends to act as an intervenor in a judicial action against this order and, along with our member companies, will continue our push to restore strong, enforceable net neutrality protections through a legislative solution,” Michael Beckerman, CEO of IA, said earlier this month.